Inspection top to bottom: Now that the weather is temperate you will want to check on how your home weathered the winter. Check the roof for leaks, the gutters for damage, and the siding for cracks. You will also want to inspect your basement or foundation for any shifts. Make repairs now to prevent further damage. Clean out the gutters: April showers bring May flowers… so clear out the gutters to keep rain from pooling on your roof or near your foundation. Pest control: Spring is mating season for eight-legged critters, so sweep out cobwebs, clear debris, and check the nooks and crannies. If you live in an area prone to dangerous species like brown recluse or black widows, you may want to contact your local pest control, but otherwise, household spiders do help eliminate other bugs. HVAC system: If you have an air conditioner now is the time to check to make sure it is ready before summer gets here and everyone else is clamoring for maintenance. Now is a good time to check your home air filters and replace or upgrade to keep allergens at bay. Clear the clutter: Do a sweep around the house and get rid of junk that you don’t use! Take a little time each week to tackle a room. Closets, playrooms, and basements can be especially daunting, but getting rid of old stuff and refreshing your space will go a long way! 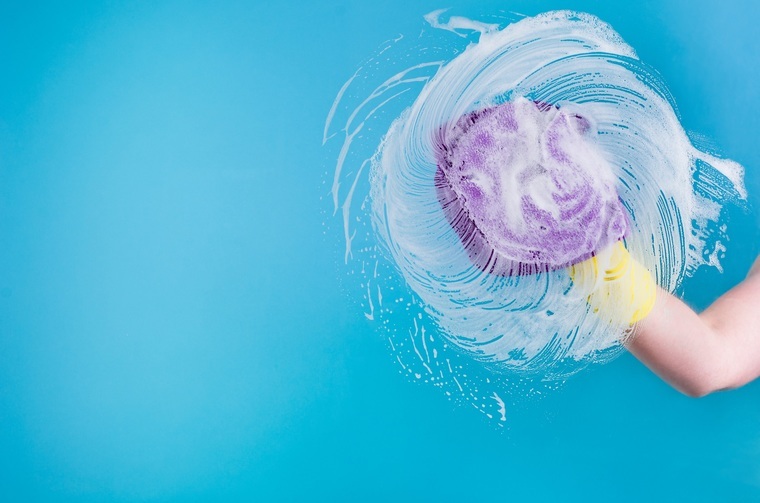 Deep clean: On a nice day open the windows, dust, wipe, scrub, and clean. You will get a nice workout and your home will look and feel so fresh after a winter of being cooped up. Update your décor: Add a splash of color to your home with small embellishments. Add a colorful vase, a lighter throw for your sofa, pretty pastel pillows, or spring-time candles, to upgrade your living space. Take it outdoors: Let your throw rugs, curtains, and other tapestries air our outside. Shake off the dust, spot clean what you can and let everything bask in the sun for an afternoon. Don’t forget the back yard: It may not be time to start up the grill, yet, but you can get started on your outdoor entertaining checklist. Check your lawn, and if you have some spare spots start filling in with seed. Check your outdoor plants, prune, plant bulbs, start to replenish the soil for your garden, and mow, so you are ready to start when the season allows. Speaking of the grill – if you have a gas grill you will want to pull this out and perform a maintenance check. Clean everything up and check to make sure all the gas lines are clear, as these can get clogged after sitting idle all winter. Make sure the grill is clear of spiders too, as they can build webs in the tubes, causing damage to your grill. You can start to bring out your garden furniture too, or clean it up if you left it covered outside all winter. Because before you know it, it’ll be barbeque season!